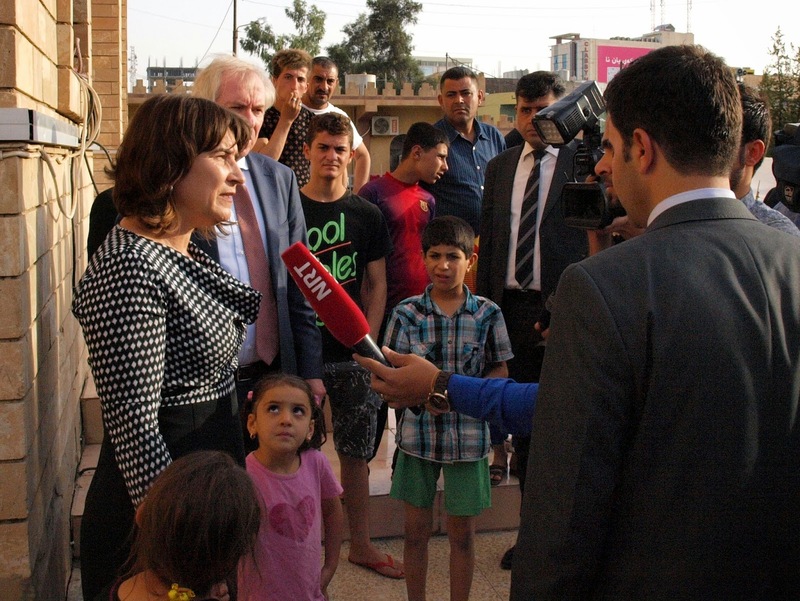 ERBIL, Kurdistan Region - The plan of the Kurdistan Region and the United Nations to prepare the housing of the thousands of internally displaced (IDP’s) in the region for the winter by November 15 is ‘very ambitious’, said the Dutch Minister for Development Cooperation Lilianne Ploumen during a visit to the region. Although her visit coincided with the start of the Eid holiday, the Minister spoke to the Kurdish Prime Minister Nechirvan Barzani and a number of high officials, while visiting both Christian and Yezidi IDP’s and Syrian Kurdish refugees. She was accompanied by some members of the Dutch press. Almost 900.000 Iraqi’s left their homes since early August for fear of the Muslim radicals of ISIS, or daash as they are called locally. They mainly found refuge in unfinished buildings and tents at a number of locations in Iraqi Kurdistan. The Netherlands has donated a total 17 million euros for the support of these IDP’s. Because the money went to a number of Dutch NGO’s and the United Nations, the direct results are difficult to assess, and Ploumen’s trip was mainly meant to take stock of the general situation. The Dutch Minister showed to be moderately satisfied, taking into account the difficult situation “where aid is needed on many different locations”. She called the present housing situation for the IDP’s “an intermediate phase which is not sustainable” and supported the government’s plan to set up 27 camps with containers and winterised tents. Although she pointed out that this is a huge operation to be finalized in just over a month’s time, she also said that the fact that the planning and logistics are in place makes it possible to succeed. During her visit the Minister insisted on talking to the victims too. Christian IDP’s on the grounds of St Joseph Church in the Kurdistan capital Erbil told her they want to return home as soon as possible. After their towns and villages are liberated from ISIS, or daash as the radical Muslim group is called locally, they want to go back. 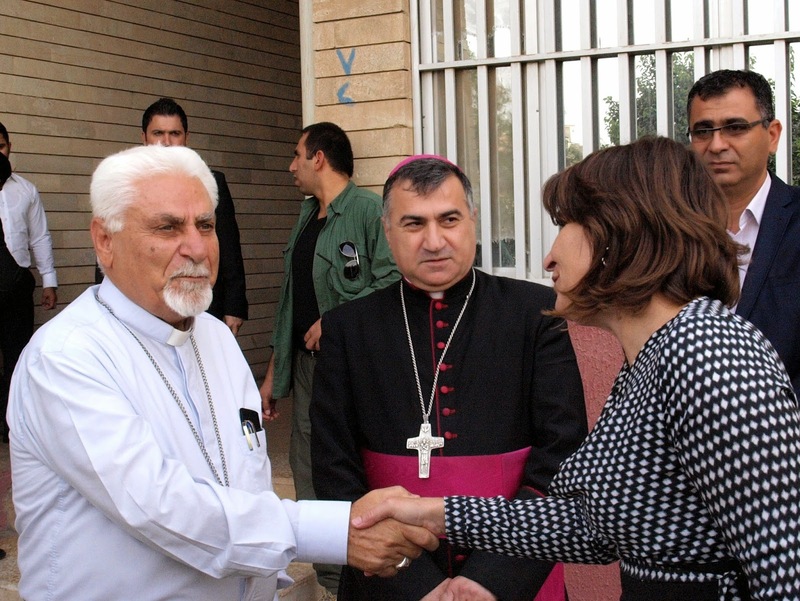 Yet at least a quarter of those who found refuge in Ainkawa, the Christian neighbourhood of Erbil have no plans to do so at all, Ploumen was told by the Catholic Chaldean Archbishop of Erbil, Bashar Warda. They do not trust the Arab villagers around them anymore as some of the worked with ISIS. That is why the Syrian-Catholic Archbishop of Mosul, Yohanna Petros Moshe asked the Dutch Minister to support those returning home after ISIS will have left. Many of his flock have found refuge in Ainkawa, and when he walked the grounds of St Joseph Church he was time and again surrounded by IDP’s requesting his attention. He expects many houses in the Christian towns and villages will be looted and damaged, as has been the case in most recaptured towns. “The people need help to be able to live there again. They will need to renovate their houses. We will need economic development to give people work and income,” the Archbishop said. Minister Ploumen supports the view that those who can eventually go home should do so, but added that for those who cannot, for instance because they are badly traumatised, help should be offered so they can settle in the Kurdistan Region. The Minister also talked to the Kurdish authorities about the problem that after two months there still has not been any formal registration of the IDP’s. Informally volunteers have kept up lists of those under their care, but this has not been formalised. For lack of exact numbers, aid workers struggle to match needs and demands. The minister wondered if the authorities could not use the national registration system of food coupons, by moving the coupons of IDP’s from their old to their new location. Iraqi’s get coupons for basic food stuffs, a regulation dating from the UN food-for-oil program of the nineties that is still the base of civilian registration nationwide. No census had been held for decades. As some IDP’s have been able to move their salaries from towns now under control of ISIS to elsewhere in order to cash them monthly, the same could be done for the food coupons, Ploumen suggested.